I’m not even sure where to begin here. We’ve reached the limits of hyperbole. We’ve reached the limits of sense. 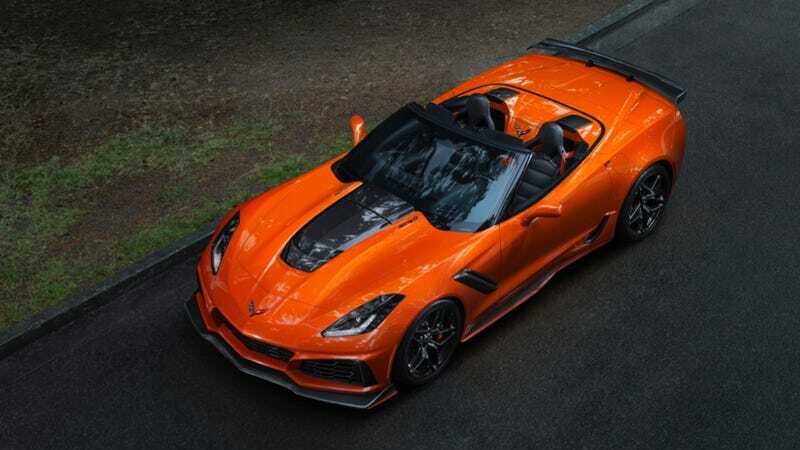 The 2019 Chevrolet Corvette ZR1 can be yours for $119,995, which is a lot for a Corvette, but this thing has an obscene amount of performance. If you need more, behold the Corvette ZR1 Convertible, a 755 horsepower, 200-plus mile an hour, $123,995 open-topped madness machine. This is the Corvette for people who want a Corvette with almost zero compromises. Chevy claims that the chassis is so stiff, that there’s been nothing done to it to keep it on the road over the ZR1 coupe. “The only structural changes in the convertible are accommodations for the folding top and repositioned safety belt mounts,” it said in a press release. The only weight gain that’s gone on at all is just a 60-pound jump, and the company says that’s mostly due to the folding top hardware. And a 60-pound gain, when you’re dealing with 755 HP, is pretty much nothing. That’s just you after Thanksgiving. In fact, there are only two drawbacks that I can see right now. The first, naturally, is that it’s a convertible, so everyone has to see your big dumb face. The second is that there appears to be some reduction in top speed, though it’s the sort of reduction that won’t make any difference to mere mortals. The top speed of the coupe is 212 mph. The convertible? Just “200+.” Sad. Zero to 60 mph in under 3.0 seconds. Thirteen radiators. I don’t even know what to do with this. It’s too much. It’s a Corvette. This isn’t possible. How is this happening?